Perhaps it is the ephemerality of the street art, the knowledge that what makes your heart throbbed today might soon be replaced by another unpredictably genre of art by tomorrow. Perhaps it is the spontaneity, the accidental collision of the masterpieces and graffiti in vandalism both colonizing the same surface of wall. Or perhaps it is the sophistication of the art forms, the implicit political and social messages embedded in those inscrutable sprays of paint and expressive stenciled images. 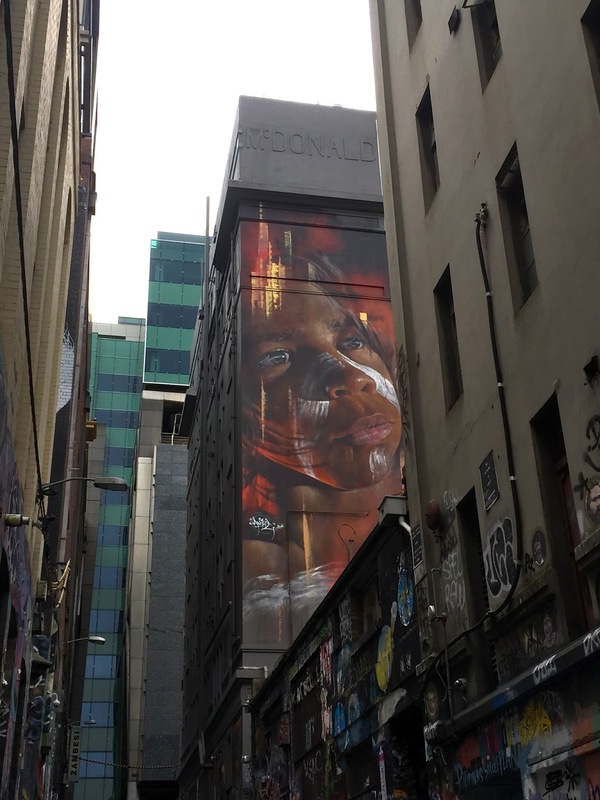 There are just too many reasons that made this narrow pedestrian laneway at the southern edge of the central city a renowned art mecca in Melbourne. So on a breezy afternoon in March 2016, I intentionally made a walking detour to the laneway to capture some of those transient public art before they disappear and being replaced by other tags and treasures. First came a masterpiece celebrating the sacredness of the aboriginal land, a cruel reminder of those ill treatments suffered by the indigenous during the white settlement. The soulful look of an aboriginal boy at the top of the wall was arresting and definitely a sight not to be missed. A Big Brother poster seated sinisterly above the graffiti covered wall, chanting silently its famous slogan “War is Peace, Freedom is slavery, Ignorance is Strength”. A perplexed cartoon panda, some abstract arts in black and white, some eccentric creatures from fairyland, an evil-looking monkey, all sitting side by side with each other in this bizarre gallery of modern and old-fashioned paintings. 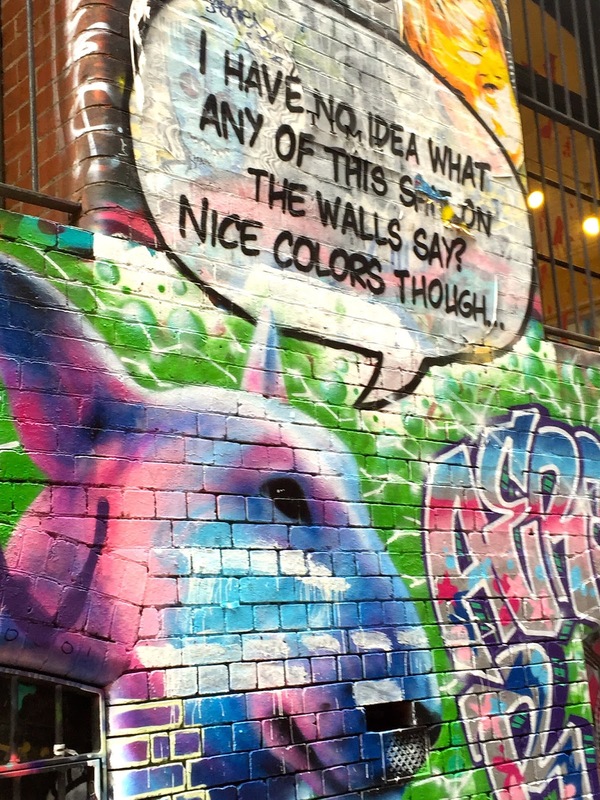 There are plenty other locations in Melbourne that display such unique form of street arts. We will leave those for another day. 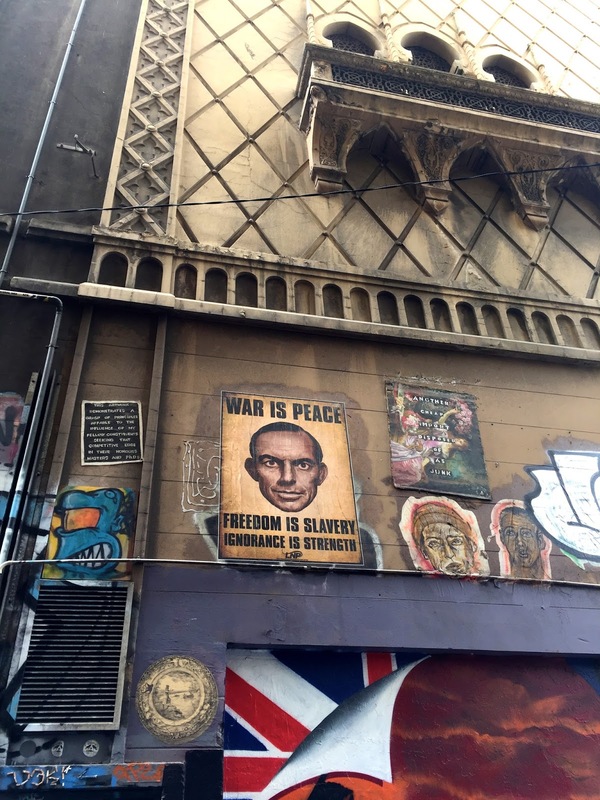 But as for now, let’s just indulge in these luxurious arts offered by the distinctive Hosier Lane.